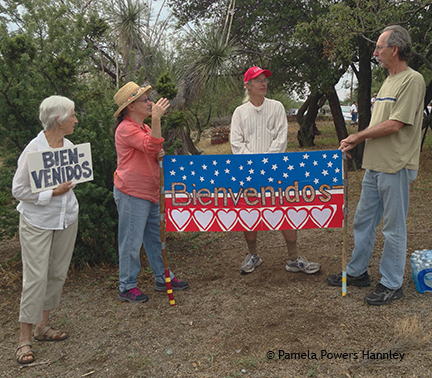 Supporters lined the main drag in Oracle, with bilingual or Spanish signs welcoming the the refugee children. 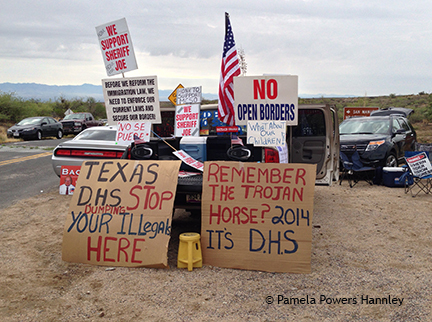 Demonstrators with dueling banners and ideologies lined the roads of rural Oracle, Arizona on Tuesday awaiting the arrival of 40-60 child refugees. An estimated 150 protesters, dozens of law enforcement officers (including the K-9 unit), and every TV, print, and online journalist imaginable came out to “greet” the bus of unaccompanied Central American children. Oracle residents and other refugee supporters from Somos America, Progressive Democrats of America, South Side Presbyterian Church, and the Alliance for Global Justice gathered at 6:30 a.m. 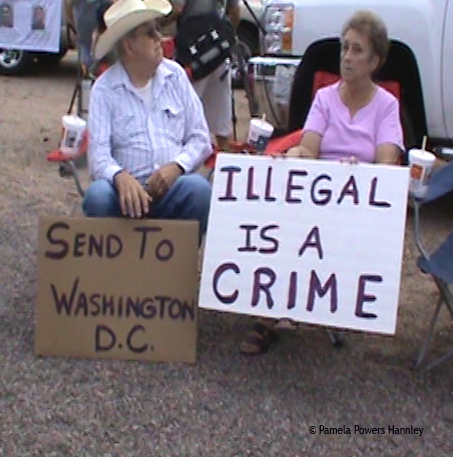 The original anti-immigrant protest was organized by Oracle’s self-proclaimed “Paul Revere” Robert Skiba, who was tipped off regarding the busload of refugee children by Pinal County’s Tea Party Sheriff Paul Babeu. 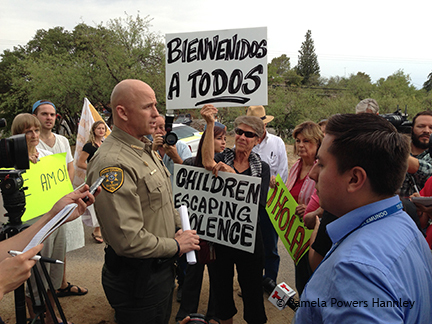 Babeu’s grandstanding on Facebook about the federal government’s failed immigration policies, and Skiba’s boasting about a bus blockade to multiple media outlets sparked a counter protest initiated by Oracle residents who were concerned about the welfare of the children. E-mail blasts, Facebook, Twitter, blog posts like this one, and a re-Tweet by Rachel Maddow’s blog brought out the crowds, including sympathizers on both sides who drove in from Tucson and Phoenix. Much of the media coverage has focused on tiny events that occurred during the four hours that we all waited for the bus to arrive. 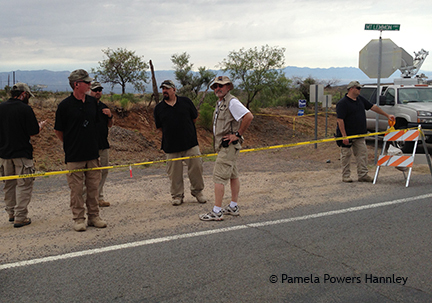 Babeu talks with refugee supporters and the media before going to the Tea Party camp to hold a press conference in the middle of the road that no one was supposed to block. CD1 Republican Candidate Adam Kwasman made headlines after he Tweeted about the scared children on the bus. Unfortunately for Kwasman, the two school buses who passed the groups were full of YMCA campers. The Y kids must have thought Oracle was a pretty schizophrenic town. As they passed the refugee supporters, we waved enthusiastically but wondered out loud why DHS put refugees on school buses. (The children and the bus drivers waved and smiled to us; they didn’t look scared to me!) When the buses got to the Tea Party corner, we heard shouting and lots of honking. Other stories that hit big were the mariachis mixing it up with the Tea Party and Babeu holding court with the media. There has been much speculation– by the Arizona Daily Star, Arizona Central, and Facebook politicos– about Babeu’s motives for tipping off Skiba and firing up the Tea Party and the Arizona State Militia (J.T. Ready’s former group). Except for a few tense moments, most of the day the Tea Party encampment was pretty calm. Lots of waiting, flags, and loud country music. The untold story from Oracle is that of the humanitarian citizens who are concerned for the refugees’ welfare. 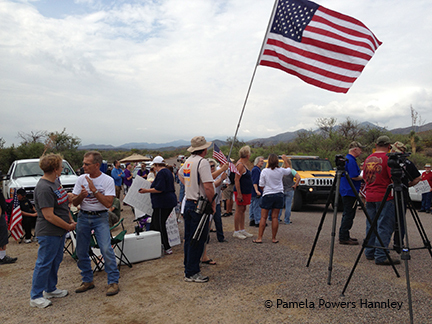 Although there have been many estimates about the crowds, Babeu told the Tea Party camp that just as many or moresupporters were down the road, ready to welcome the children. At one point, there were approximately 100 refugee supporters lining American Ave. and the Mt. Lemmon Highway with Spanish or bilingual signs of welcome. It was difficult to estimate the Tea Party camp, a few miles down the road, since there were so many law enforcement officers and media there. I spent more than an hour at the Tea Party end, and I believe at most there were about 50-60 actual protesters and armed militia. The signs held by the two groups of protesters couldn’t have been more different in their messages. 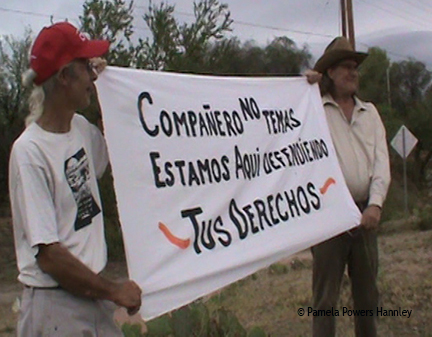 Here, a Spanish sign which reads: Friend, don’t be afraid. We are here defending your rights. Throughout the day, there were rumors about when or if the buses would arrive. 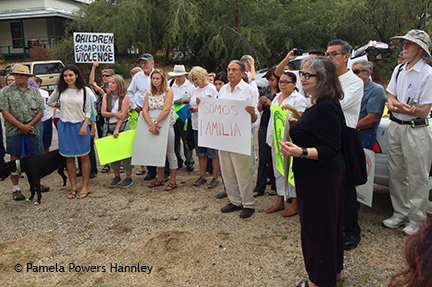 Although the crowds dwindled some, many held out until pro-pro-refugee organizer Frank Pierson told supporters that Congresswoman Ann Kirkpatrick’s office told them the buses were not coming that day, but that the children would come to Oracle in a few weeks. At the supporter end of the road, the day closed with a group hug prayer led by Rev. John Fife, retired minister from the South Side Presbyterian Church and veteran Sanctuary Movement leader from the 1980s. Will there be a repeat of Tuesday in two weeks? Stay tuned. Rev. 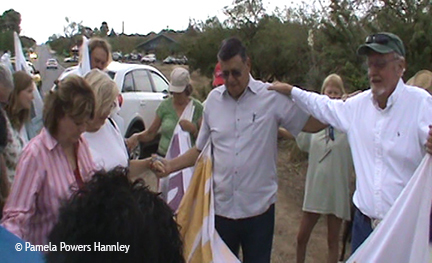 John Fife leading a prayer for the safety of the refugee children before supporters dispersed. Shielding angels balanced the militia. The image of this collection of signs went viral. Obviously, there were many signs and many messages, not just this one. These signs were on the corner where the refugee buses would have turned to go to Sycamore Academy. This sign was at the corner of American Ave. and Mount Lemmon Hwy. 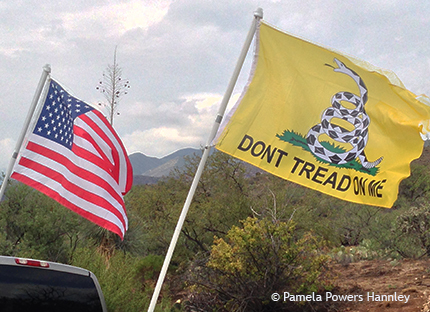 Tea Party signature flag: Don’t Tread on Me. 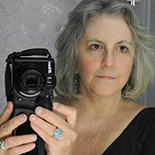 This entry was posted on July 17, 2014 by Pamela Powers Hannley in 2014 elections, Ann Kirkpatrick, Barack Obama, Congress, democracy, Democratic Party, Drugs, Economics, equality, Free Speech, Immigration, jobs, Media, Progressive Democrats of America, racism, Republican Party, SB 1070, Tea Party, War on Drugs and tagged Oracle, Paul Babeu, refugees.